TALLADEGA, Ala. — Times were already changing long before Jimmie Johnson strolled through a Las Vegas casino unnoticed, full firesuit and all. It was the start of NASCAR's playoffs and the seven-time champion, wearing a flame-retardant billboard, was surprised that he failed to garner even a quizzical stare. Johnson had already lost Lowe's, the only sponsor he's had at NASCAR's top level. Now he was just another face in the crowd even though the start of the playoffs were just days away and the most decorated driver of his generation was there to promote. How utterly off-kilter for Johnson. But losing Lowe's, floundering in a long losing streak during a dismal time at Hendrick Motorsports, going unnoticed in a hotel lobby, none of that compared to what was still to come in this bizarre season for "Seven Time." The biggest stunner came this week when team owner Rick Hendrick, after 17 years of babysitting the delicate relationship between Johnson and crew chief Chad Knaus, pulled the plug on the longest pairing in NASCAR. Knaus built the No. 48 team around Johnson from scratch. He was atop the pit box for the record-tying seven titles and 81 of Johnson's 83 career Cup victories. The two have been together since bachelorhood, through marriage and now children for both. They were fueled by the chase for eight, the elusive number neither The King of The Intimidator could reach. Their farewell tour begins Sunday at Talladega Superspeedway, and when they part, Johnson still will be tied with Richard Petty and Dale Earnhardt Sr. with seven titles. Knaus will be tied with crew chief Dale Inman. Knaus is moving to the No. 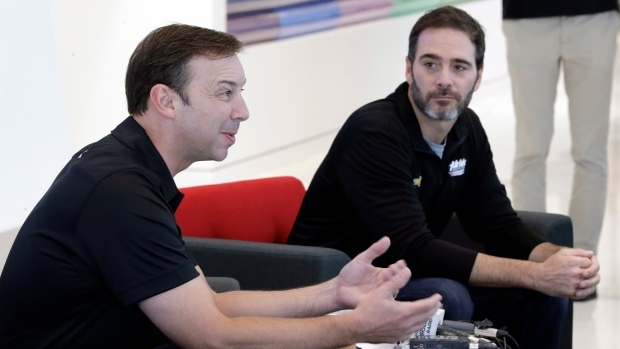 24 team, where he started at Hendrick Motorsports so many years ago building cars for a new guy named Jeff Gordon, to crew chief another fresh-faced young talent in William Byron. Rick Hendrick went to his farm system to pair Johnson with Kevin Meendering, one of those lifelong Hendrick guys who started with the company as a high school part-timer and learned how to be a crew chief. It is the end of an era, indeed. "We've lasted longer than the average length of a marriage in the United States. We've worked really hard," Knaus said. So hard they nearly destroyed the relationship on more than one occasion. Johnson and Knaus aren't wired the same but have always chased winning. The path each took wasn't always orderly and Knaus, so rigid, intense and inflexible, sometimes clashed with Johnson's easygoing demeanour. The louder Knaus yelled, the quieter Johnson became. Hendrick threatened to break them up. Sat them down over milk and cookies because they were acting like children, blaming each other and bickering over their inability to win a championship. They agreed to work as hard on their relationship as they were working on their goals, and it led to title after title and a winning pace not seen in decades. Only now they aren't winning anymore, and for a variety of reasons that Johnson and Knaus cannot solely control. Hendrick Motorsports is in a massive rebuild, Chevrolet has lagged behind its competitors this year and Johnson's young teammates don't know what they don't know so aren't in position to take charge of the march out of this mess. That's how Johnson gets stuck in a 53-race losing streak headed into Sunday. And at some point, Hendrick has no choice but to step in and try something new, anything new, even if it means splitting the greatest combination since Petty and Inman. "It's not like we're trying to kill each other. That's not where this is," Knaus said. "It's an opportunity for growth for both of us. In order to be committed in a team-oriented environment for that long, there's a lot of deep digging that you have to get through. "And we've done that, and we've put forth the effort and it's time right now to do something different. It really is it's the right time for the company." So, six more races, that's all these two have got left together, and they'd like to make it count. Johnson tried to snap that losing streak two weeks ago on the roval at Charlotte but his attempt at a last-lap pass of Martin Truex Jr. ended with both drivers spinning and Johnson knocked out of the playoffs. But anything goes these final six weeks because when it's over, nothing will be the same. Knaus will be at the No. 24 trying to mould Byron into the next Johnson or Gordon. Johnson will have a new sponsorship and new face leading his team as Hendrick gives Meendering a chance to be the next Knaus. Until then, they have nothing to lose and every reason to try to snap that losing streak and celebrate one last time in victory lane together. "We're fierce competitors, we both want to win races, we both want to win championships and we acknowledge the fact that we've had a hell of a run," Johnson said. "It's been a long, amazing run of 17 years. Sometimes change brings new opportunity. Change brings excitement, a new breath of fresh air, a spark. "Whatever it might be, that opportunity is now here for us. We've been highly committed to each other, this team and our relationship, but it's just to the point where we feel like change is the next step and potentially the next step for our next level of greatness as individuals. It just feels like it's time."